Melanie Collins MD joined the Renaissance Women’s Group in 1996. She is a board certified Austin ObGyn. 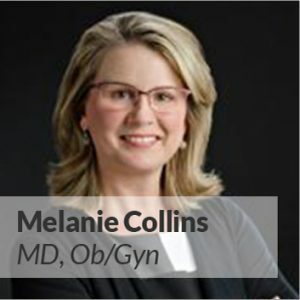 Dr. Collins grew up in Temple, Texas and did her undergraduate work at The University of Texas at Austin. She has a degree in Zoology and was elected to the Phi Beta Kappa honor society. She completed medical school and residency training at The University of Texas Medical School at Houston. While there, she was elected to the Alpha Omega Alpha honor society and chosen as the outstanding chief resident. Before moving to Austin, she was on faculty at The University of Texas Medical School at Houston and MD Anderson Cancer Center where she did research on cancer prevention in women. She has served as the Chief of Obstetrics/Gynecology at North Austin Medical Center and currently is on the hospital’s Ethics Committee. She is married to an Orthopedic Surgeon, Dr. Michael Andreo, and they have 2 boys, Matthew and Cary. In her spare time, Dr. Collins enjoys traveling, cooking and golf.